Disney's Contemporary Resort & California Grill: The best of the Disney World Resorts? Here's Why. 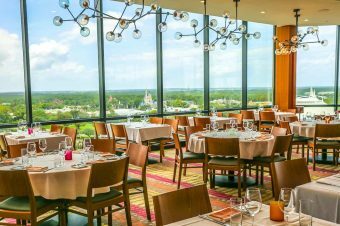 Considered the most deluxe Disney resort until the Grand Floridian came along, The Contemporary Resort boasts a guest experience few of the other Disney World Resorts can. It might be time for a rematch. The Contemporary was one of the two original resorts when Walt Disney World opened in 1971, along with the Polynesian. There are families who experienced it in the 1970’s who loyally return to these two properties now with their kids and grandkids. Over the years the Contemporary Resort has done significant renovations and updates, and for a luxury hotel writer not typically pleased with deluxe Disney resorts for their price-value equation, I report that the Contemporary (check your dates for rates) is now my resort of choice if I need to stay on Disney property, followed by the Beach Club. A view of Magic Kingdom from the Disney Contemporary Resort. Originally slated as the Tampo Bay Resort, it absorbed its nickname “The Contemporary Disney Resort” during its development and construction phase because no one seemed to be able to stop calling it that. Mickey meet Miro. Miro Meet Mickey. 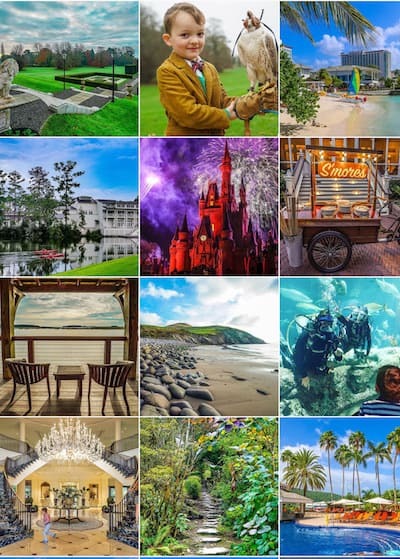 Regular Luxe Recess readers know that I’m always drawn to historic properties, and relative to the history of Lake Buena Vista, the Contemporary can boast more of a pedigree than other Disney World Resorts. Great Disney trivia: Richard Nixon delivered his infamous “I am not a crook” speech in 1973 to the Associated Press Managing Editors annual meeting held at the Contemporary. Disney World brought in Los Angeles architect Welton Becket to design the Contemporary. Becket’s other famous projects include the Beverly Hills Hilton as well as the Capitol Records building in Los Angeles. Having the Monorail go directly through the hotel’s A-frame building was novel and innovative for visitors at the time. But the construction of the hotel was what was intended to be truly groundbreaking. Disney collaborated with Becket, the American Steel Corporation, and Donald Wexler, to pre-construct hotel rooms and slide them into steel frames. Wexler, a well established Palm Springs architect, designed the original Disney Contemporary Resort rooms. Although innovative, the atrium A-frame doesn’t produce the most calming hotel lobby environment. The downside to this unique design is that the ambiance of this open atrium of the A-frame building that was really innovative in the early 1970s gives a feeling like you’re at a very crowded and busy airport terminal and food court. Not good. A hotel bar or restaurant shouldn’t make you feel like your flight has been delayed. 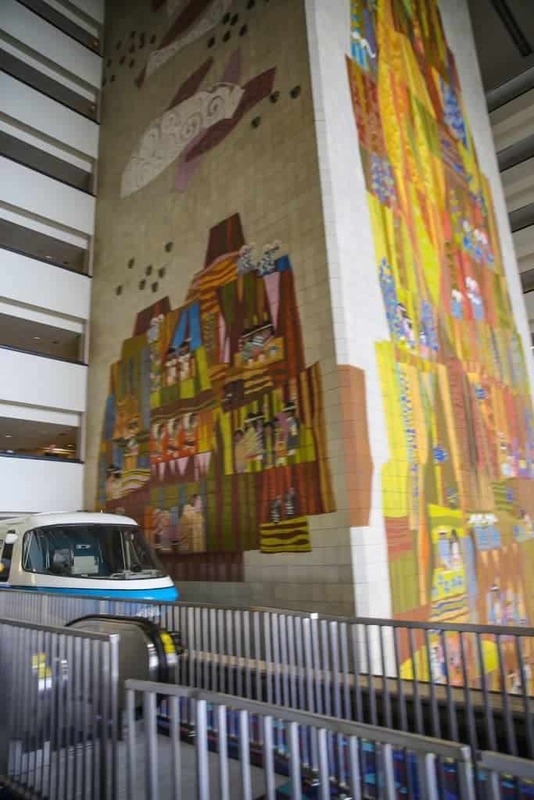 Mary Blair’s ninety-foot mural in the atrium of the Contemporary Resort and the monorail. The neon lights used throughout in the signage don’t help either. 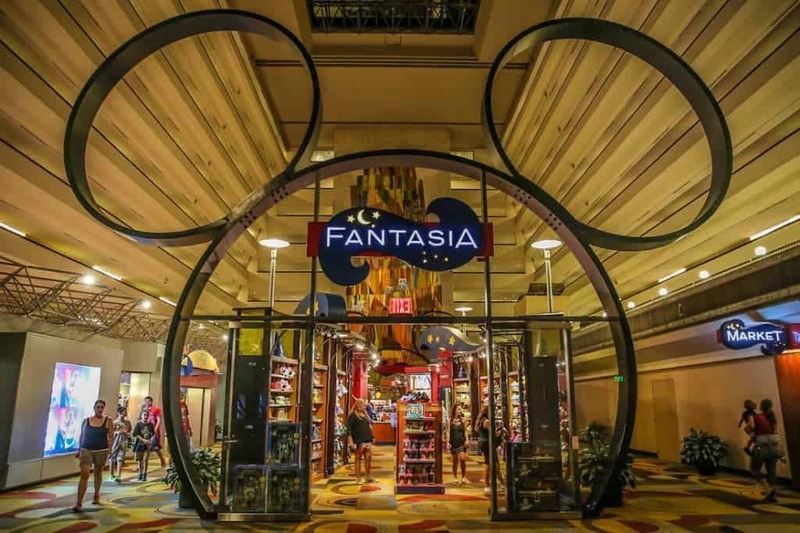 This would be the biggest downside to the guest experience at the Contemporary when lobbies like that of the Grand Floridian or Animal Kingdom Lodge exist. 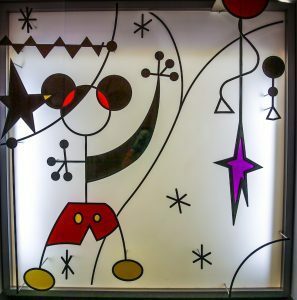 Mary Blair designed the multi-story mural that is the showcase art in the atrium. This ninety-foot tall work in her signature style will look familiar. Her murals appeared throughout Disneyland, too, and she also created character designs for It’s a Small World, a Disney park work of genius, and various classics like Alice in Wonderland, Peter Pan, and Cinderella. The Mary Blair mural is a slice of Disney World history, as it displays ironically in Disney’s Contemporary Resort. For those who would like to read more about her contributions in her career as an artist for Walt, read this article from one of Disney’s sites, Oh Disney. 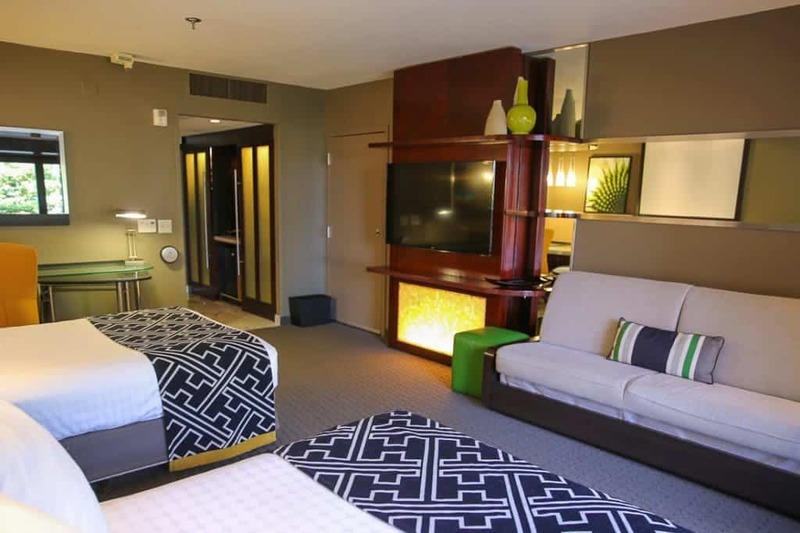 Choosing rooms at the Contemporary will depend on personal preference. I have no issues with walking and preferred the quiet location of the Garden Wing compared to a room opening onto the atrium of the main building. A standard Garden Wing version of a Contemporary Resort room is quite stylish. The Contemporary Resort room themes of a modern and minimalist spin on classic Disney iconography translates better than other resorts’ themes. Canary yellow, spring green, black, white, and wood grain make the room feel current. The two queens and a day bed would comfortably fit a family of four, and five in a pinch. The bathroom was beautifully updated and spacious and came with an impressive array of amenities. The closet spaces, interior of the room, and bathroom were well done for Disney World, really feeling like a Four Diamond hotel (which the Contemporary is). Contemporary Resort Garden View rooms with patio overlook the pool. Closets, coffee makers, and fridges at the Contemporary Resort. I had a beautiful patio overlooking the pool, and I will happily say that this was the nicest hotel room I have seen at a Disney property, as one who isn’t typically thrilled with the rooms at Disney World resorts. 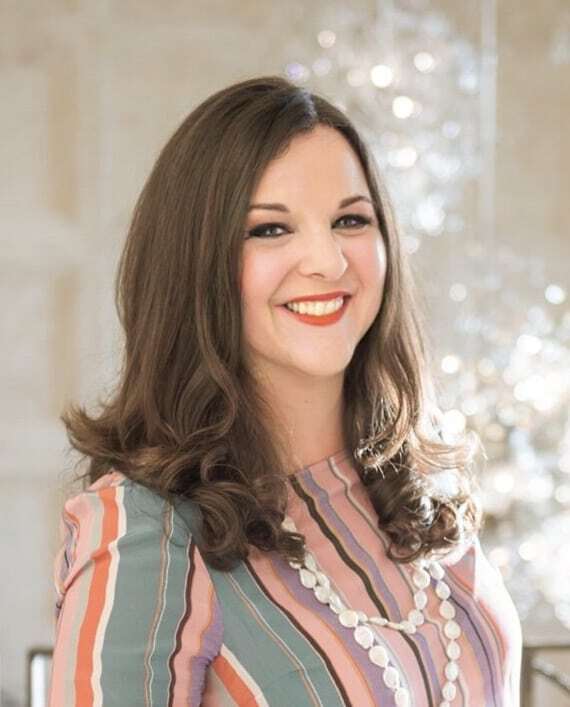 I know that many of the resorts are having what the hospitality industry calls a “soft goods” renovation to update bedding, window treatments, etc. This is a good thing. Updated black, white, and gray bathrooms at the Contemporary were lovely. 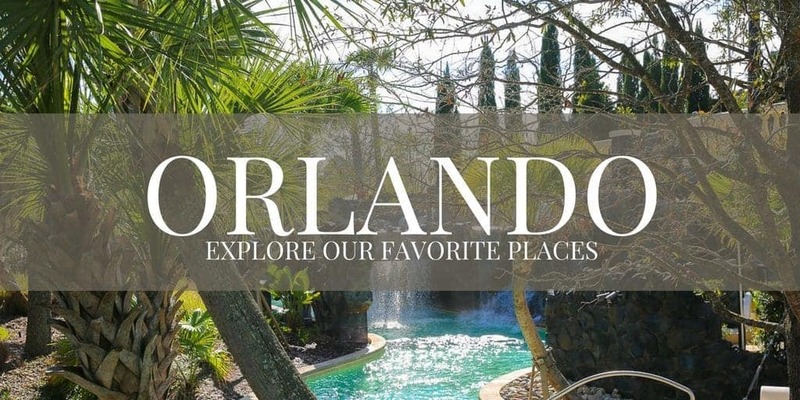 If you are accustomed to five-star hotel rooms, you are better off staying at the Four Seasons Orlando. But if you’d like to start your Disney vacation on property for those additional benefits, like earlier access to Fast Pass reservations, then this is a great place to start. ABOUT PLANNING YOUR NEXT DISNEY VACATION. 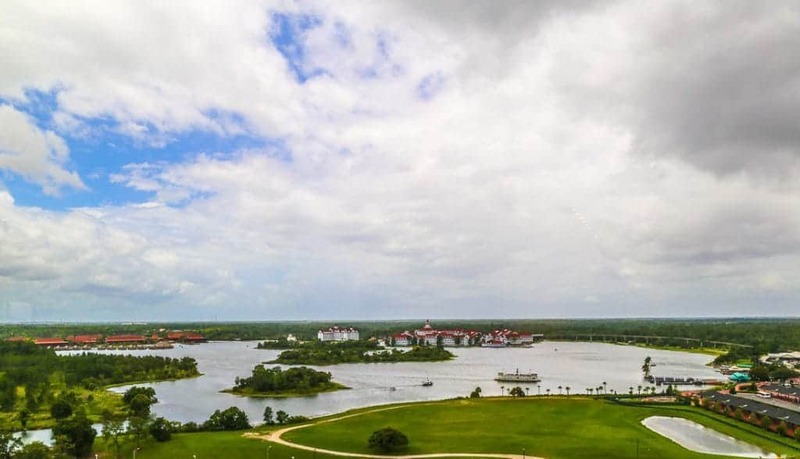 The Bay Lake Tower is exclusively used for Disney Vacation Club villas. The Bay Lake Tower opened in 2009 and has an upgraded pool area and waterslide, but it is restricted to guests staying the Bay Lake Tower. 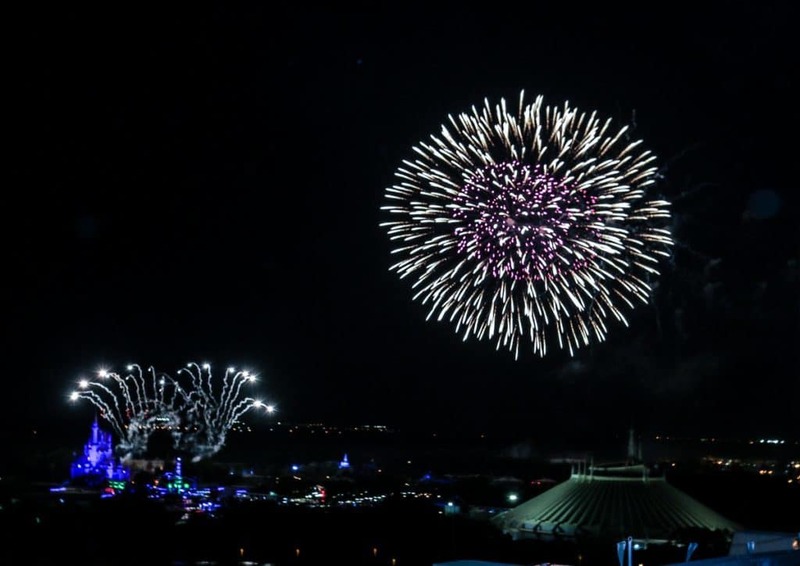 There is also a Top of the World lounge where DVC owners watch the Magic Kingdom fireworks that offers a limited menu and full bar. The larger suites at the Bay Lake Tower are two-story and have views of Magic Kingdom’s nightly fireworks show, even from some of the bathtubs. They are definitely worth considering to get the most luxe options on Disney property. 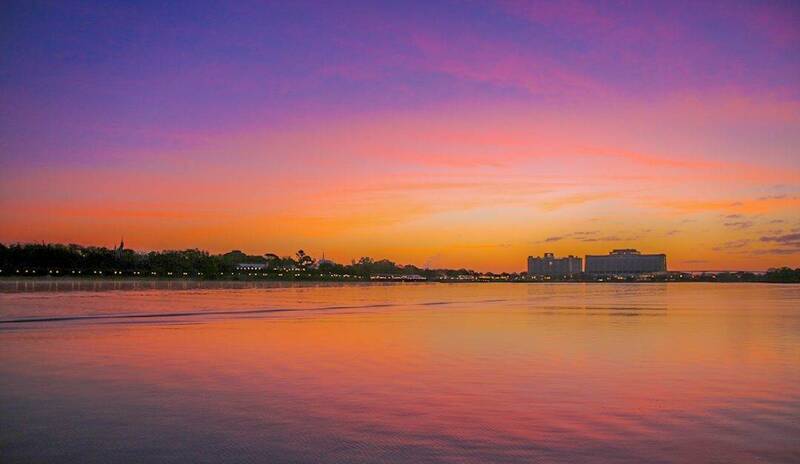 There’s a way to save as much as 50% off of a stay if you book a villa in Bay Lake Tower. You can see how much you will save by using David’s point calculator on your stay dates and then compare that cost with booking the villa units directly. You must pay a refundable deposit for them to query owners for your stay, and they look at first, second, and third choices you list. When they have been unable to book me something, they refunded my deposit quickly. The agents have typically found alternate options for my dates if my first choices weren’t available. The only drawback by using David’s service is that you will not receive daily housekeeping without a fee, and you must commit to your travel dates. 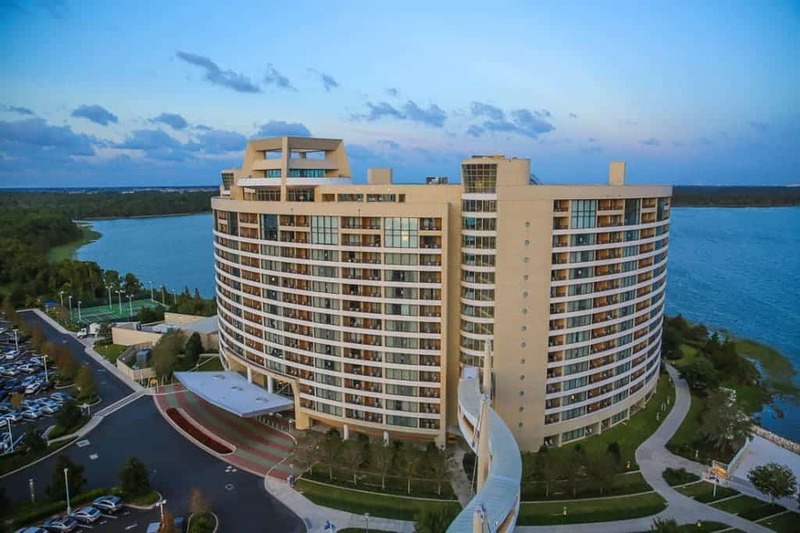 The Contemporary Resort’s address is undeniably the best in all of Disney World. There’s no other resort that can boast Disney park access by monorail, boat, bus, and by foot to the Magic Kingdom. Boat transportation from the Contemporary Resort starts at sunrise with a smile. Of course, it is convenient to be a monorail resort. Guests can use it to reach the Polynesian and Grand Floridian as well as the Transportation Center where they can change to the Epcot monorail. 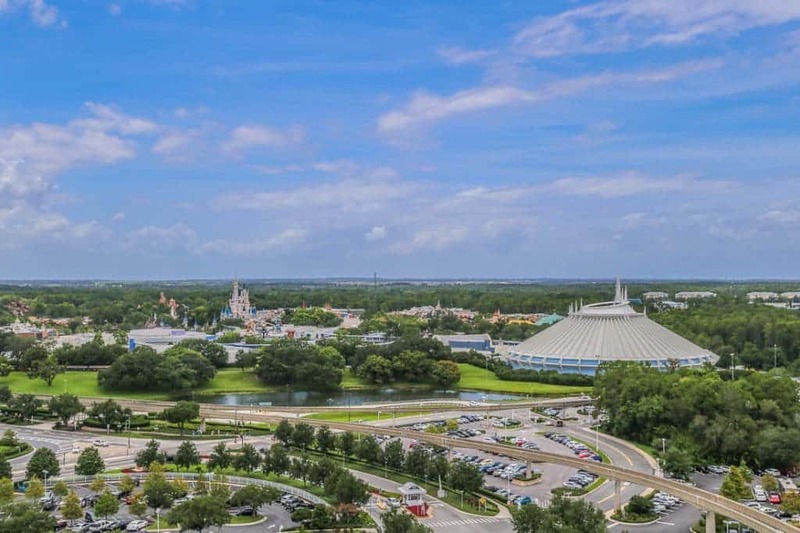 But the biggest advantage of the Contemporary Resort is that it has a sidewalk that leads directly to the entrance to Magic Kingdom as well as the bus parking area that the official Disney resort buses use. 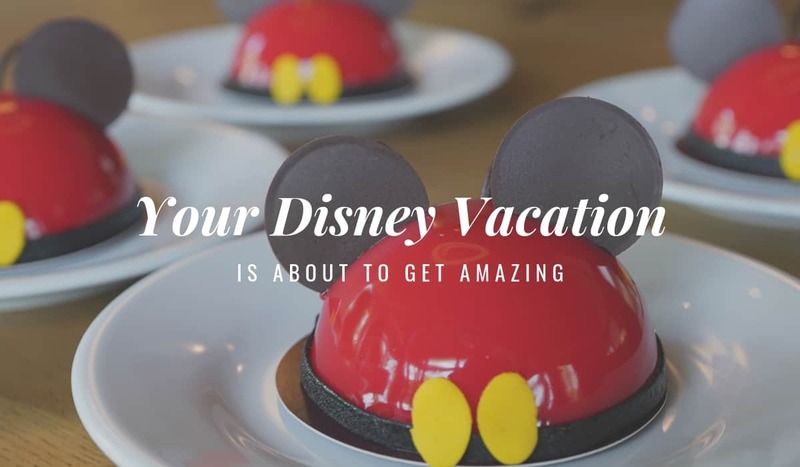 This means that a family can easily access any resort for a Disney dining reservation and take a Magic Kingdom-bound bus back without the need of a rental car or an Uber. The Contemporary does have its own bus stop outside the front entrance with access to the other parks and Disney Springs. 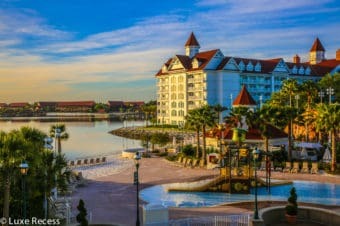 With Seven Seas Lagoon and Bay Lake on either side of the Contemporary Resort, water view rooms are easy, and one can grab a boat behind the resort to the Wilderness Lodge and Magic Kingdom, and boats to the Polynesian and Grand Floridian are accessible next to the bus stop for Magic Kingdom. Cabana rentals are available at the Contemporary Resort. 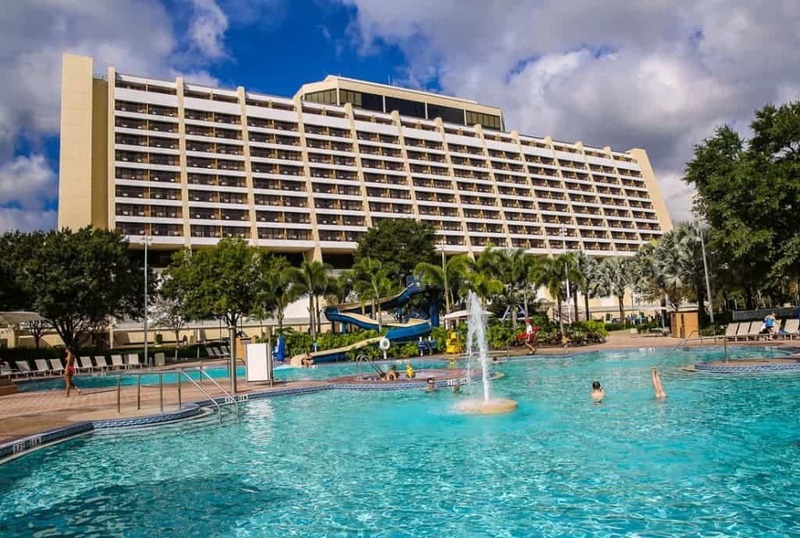 Disney resort pools include a variety of play areas for families, but the Contemporary Resort pool is an 8 out of 10 compared to other deluxe Disney resort pools. It lacks the fancier waterslides that the Bay Tower pool has, but it offers a lakefront pool for adults, a splash zone, and cabana rental. 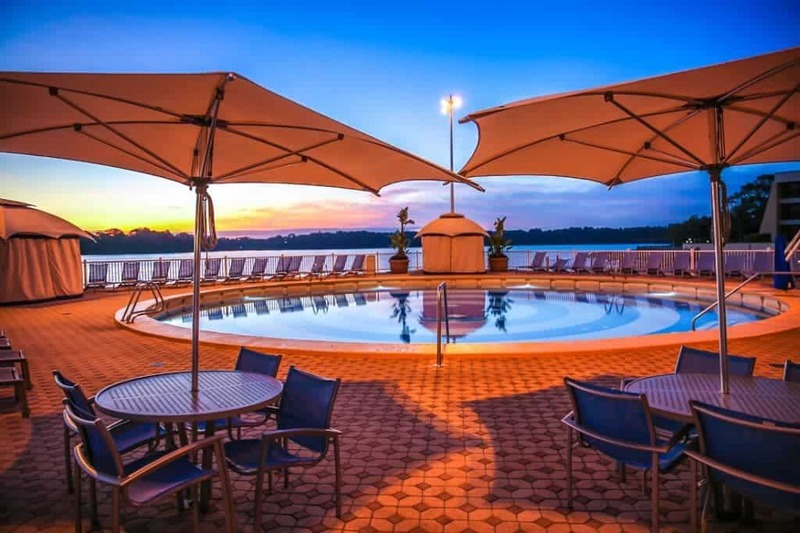 A lakeside pool for adults at the Contemporary Resort. 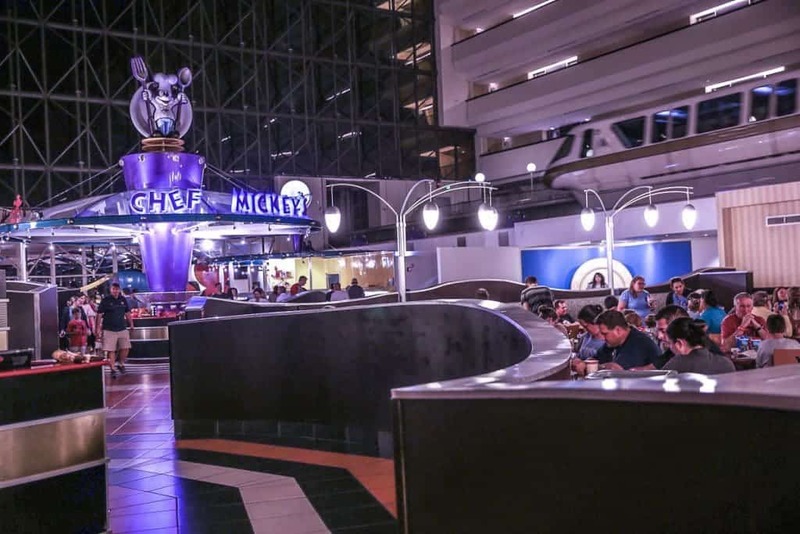 I am perplexed why Chef Mickey’s is one of the more difficult Disney Dining reservations to grab, but I think many families like the fact that Mickey and Goofy are on hand for a picture. I suspect that some families have just made it a Disney World tradition since it opened in 1996. That also means that those who dined there as kids are old enough to come back with their children now and are paying a nostalgia tax. I want to say that I have absolutely noticed Disney World trying to elevate their dining experiences since we became regulars six years ago from the budget to the signature restaurants. But I’m happy to pass on Chef Mickey’s. It’s the last place I would ever eat because I’ll be eating that same food from a Styrofoam container at the airport on our way home. And also because one of the best restaurants at Disney World is right upstairs, blowing all the others out of the murky waters of the Seven Seas Lagoon. An airport foodcourt? No, the suspiciously popular Chef Mickey’s at the Contemporary. California Grill is an exception in nearly every way to other Disney World restaurants. First, I want to admit I haven’t yet been to Victoria & Albert’s. I’m well aware of how important Scott Hunnel has been to the Orlando food scene, and I really look forward to trying it one day should I find myself at Disney World without my family. But we do have children, and it is not the type of meal we are going to have on a family vacation while at Disney World. I’ll save the babysitter for a gastronomic adventure in Paris. We enjoy Disney World because we can take our kids to restaurants with solid children’s menus, and other kids always make more noise than our own. I think California Grill is the ultimate signature restaurant for foodie families to experience at Disney World. Grab a glass of California Sauvingon Blanc after ordering the incredible halibut and take your kids to see the sunset views. This is my version of a luxury Disney World vacation. The vibe of the California Grill is festive and adult and feels like it’s a newly opened a restaurant in downtown San Francisco—OK, maybe Sacramento. Let’s just say Chef Mickey isn’t in this kitchen. 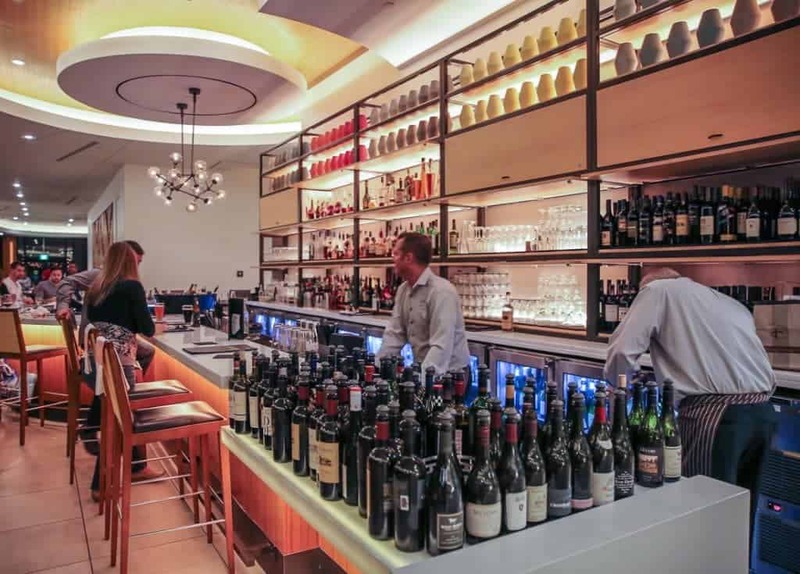 Wine lovers will rejoice at the extensive selection at California Grill. 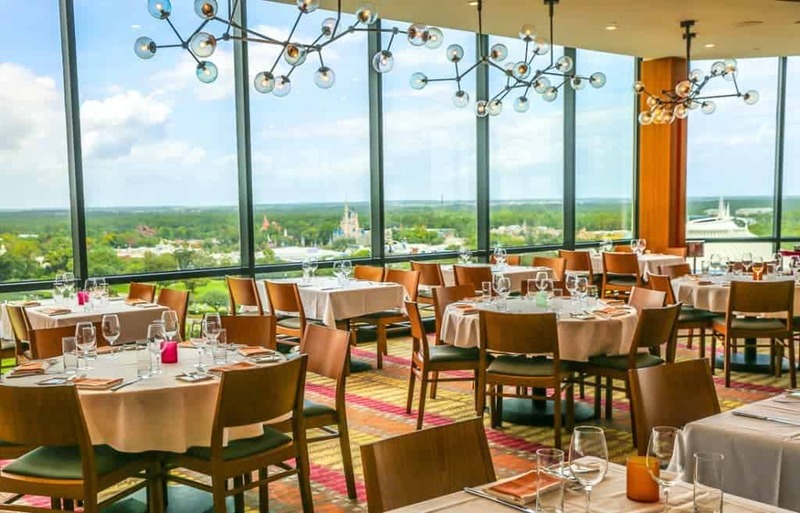 Occupying the penthouse of the hotel, California Grill is truly the Top of Disney World (the former restaurant in that space for years was called Top of the World). Viewing patios extend off either side of the restaurant where patrons can watch fireworks at the Magic Kingdom each evening next door. Guests can also view the fireworks from many tables should they wish to remain inside. The firework show’s short-lived music is piped into the restaurant speakers as Narcoossee’s does over at the Grand Floridian. Firework views from the California Grill every night. 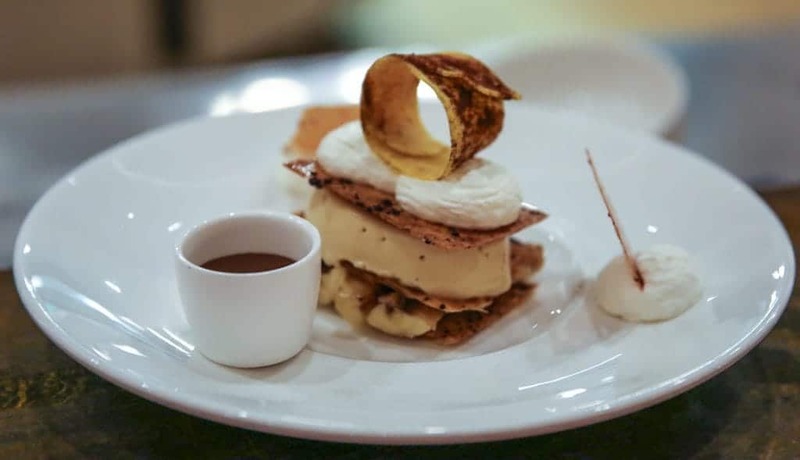 A new evening program called Celebration at the Top is available on select nights where guests can enjoy appetizers, small plates, wines, and coffees in one of the private dining rooms in the back of the restaurant with access to one of the viewing patios. Given the $99 price tag per person, I think it is a shame not to spend that at dinner. It’s a last resort if no table is available during your visit. And you will need to book far advance for a table. No reservation? Show up early and grab a seat at the bar and you can still order from the complete menu. 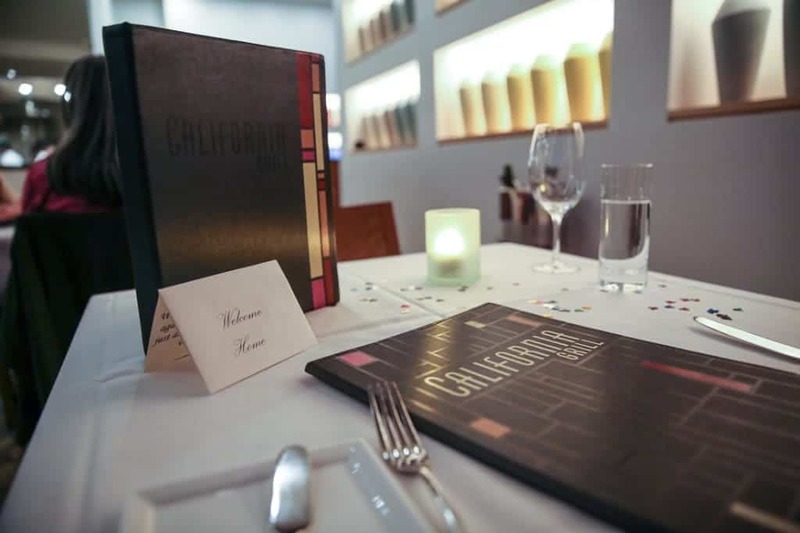 The California Grill menu emphasizes ingredients from Golden State farms, wines, and food purveyors. 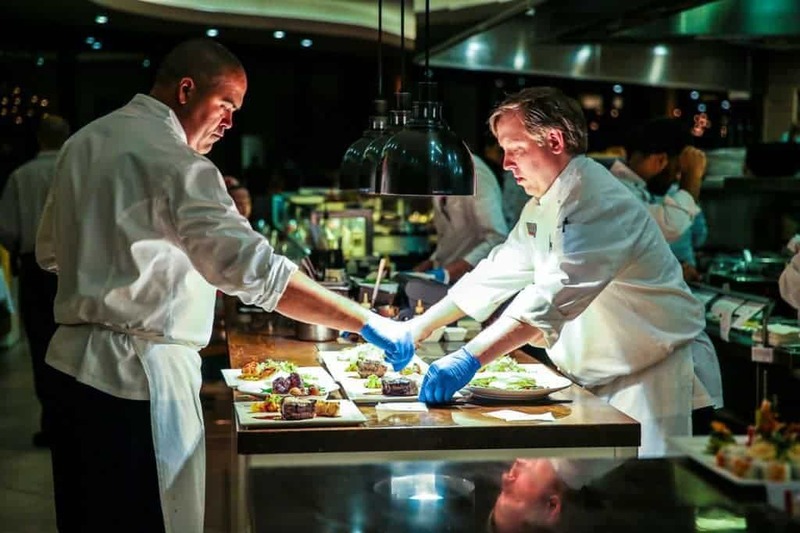 House made sushi, charcuterie, cheeses, and American fusion fare are what’s for dinner on a changing seasonal menu. It varies on each visit, so my recommendations might not be relevant, but the halibut is really perfect. The Banana Buzz dessert at California Grill. 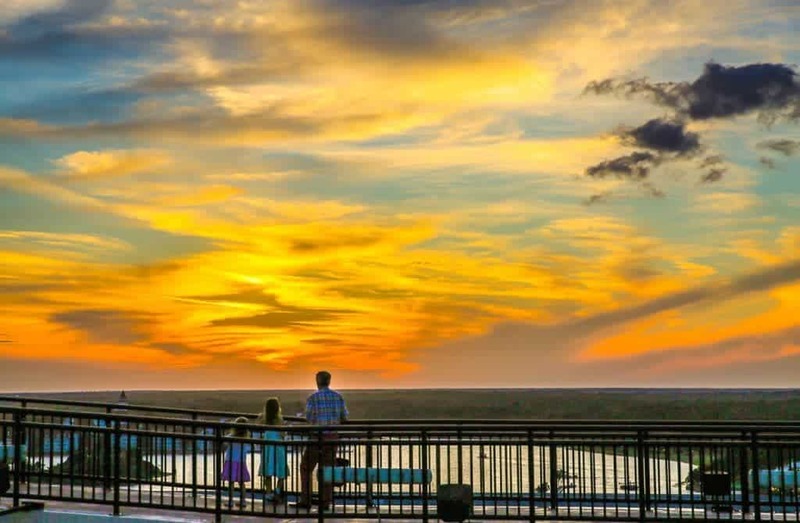 Children have a solid menu to choose from, too, and the views will captivate those who haven’t fallen asleep in their strollers from a big day at the parks. Steak, salmon, or chicken with vegetables and potatoes will please most kids. There are emergency offerings like pizza for the pickier kids. When the California Grill Sunday brunch started, I was excited to try it. My son and I were visiting Disney World, and I figured it would be the perfect way to end a crack of dawn start of a summer morning in Magic Kingdom. What I hadn’t thought through when making this reservation was how hot and unkempt I would feel while eating such a nice meal. Because most people think of California Grill for the firework views, brunch is still a quiet affair compared to dinner. A jazz trio played near the Bloody Mary bar, and my son ran straight to the windows for the view. The Polynesian and Grand Floridian resorts are easily seen on the other side of the Seven Seas Lagoon. The boats shuttling between docks are the only visible movement. It’s quite a contrast to Be Our Guest’s breakfast in the Magic Kingdom. The Polynesian, Grand Floridian, and Magic Kingdom views from California Grill. The brunch has a price per person package that includes everything, starting with a complimentary mimosa. Children are not priced differently, however, so I confess I drank my son’s because I wasn’t going to let it go to waste. Would you? The first course of the brunch is served buffet style: delicious sushi, cheeses, charcuterie, and salads to start, and my son found items like fruit and cheese to snack on. I didn’t see an obvious entrée for him because I didn’t want him to eat pancakes, so the kitchen made a chicken Milanese in place of chicken fingers with French green beans. He ate every single bite. The staff in the open kitchen watched him devour all 30 or so green beans and came over and gave him a high five for eating all of his vegetables when he was done. A dessert plate from the California Grill brunch. 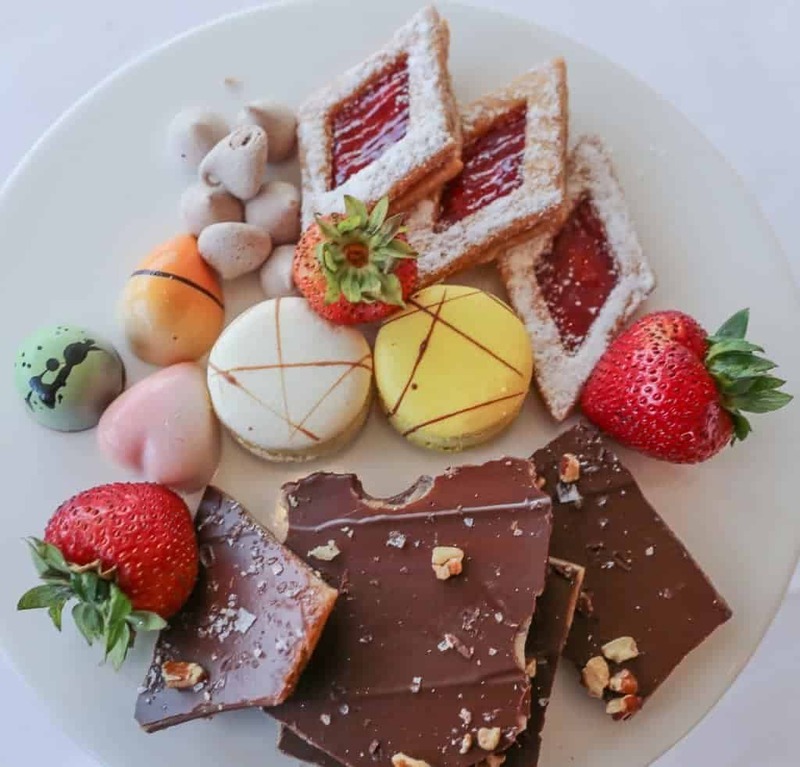 Brunch finished with a dessert plate of chocolates, toffee bark, berries, macaroons, meringues, and cookies. Disney World likes to welcome repeat guests and dining patrons with “Welcome Home,” but I have never warmed up to that little gimmick until I saw California Grill welcome me back. That one I’ll take. Check your dates for rates at the Contemporary Resort. This was the first time the “Welcome Home” made me giddy.